Mercedes-Benz E-Class Performance, Engine, Ride, Handling | What Car? The four-cylinder diesel engine in the E220 d is smooth, quiet and pulls strongly from around 1500rpm, while the standard nine-speed automatic gearbox kicks down promptly when you floor the accelerator. Given that it’s just as frugal as the entry-level E 200 d and barely any more expensive, it’d be our choice. Meanwhile, the V6 E350 d is effortlessly strong. Even light pressure on the accelerator pedal will see you waft up to speed briskly. There's a muted hum, rather than an obvious chug, at tickover, and even when you accelerate hard, the V6 is quieter than the four-cylinder engine in the E220 d.
The AMG-badged E53 accelerates strongly when you work its 3.0-litre V6 petrol engine, but it doesn’t have the effortless pace of the E63 S or even the E350 d. It sounds tuneful and has a fairly broad range of performance, the car’s twin turbochargers providing decent low and mid-range torque. Unlike the E63, however, the E53 does need to be driven quite hard to feel really quick. The final engine option is the E300 e. It combines a four-cylinder turbocharged petrol powerplant with a battery pack and electric motor. Performance is only slightly behind the E350 d’s, with zero-emissions range of around 20 miles and CO2 emissions of just 46g/km. The E-Class is available with three distinct suspension set-ups. The E220 d rides on regular 'passive' steel springs as standard, and in this form the Mercedes is all about comfort. Its soft and spongy suspension smooths over larger obstacles with ease. True, you are jostled around a little along patched-up urban streets, but the motorway ride is always smooth. There’s plenty of body sway through corners, though, and while the steering is light and accurate, it provides little genuine feedback. 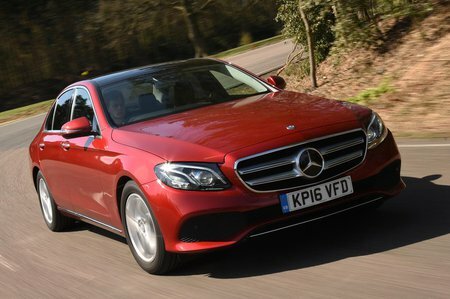 We’ve also tried the E-Class equipped with optional Air Body Control suspension, which comes as standard on the E350 d and E300 e but is a pricey option on the E220 d. We wouldn't bother spending the extra because, although the high-speed ride is superb, sharper-edged obstacles, including potholes and expansion joints, aren’t dealt with quite so deftly and can send the odd unwelcome jolt through the cabin. It doesn’t improve the handling significantly, either. We haven't tried the third option, which is a cheaper adaptive suspension system available as an option on the E220 d. The E53’s independently tuned air suspension keeps good body control and makes the car feel intimately in touch with the road surface, but it’s noisy and quite coarse, with even small edges and lumps thumping through into the cabin. Cruising refinement is generally excellent, with little wind noise at 70mph and only a gentle background road noise. That said, larger-than-standard alloy wheels do generate noticeably more noise on the motorway.